So this is the wall of bikes in my brother-in-law’s basement shop. Bill died suddenly in January. He was the guy who turned me on to bicycling back in the 90s, and to Velonews, which is where I discovered the Tech Talk forum. I have learned from lurking off and on here for years. It was through this community that I found out about the RAMROD ride, which Bill and I did together in 1999. Bill and I enjoyed many rides together, and many more beers. He was a great bike mechanic and enjoyed tinkering just for the intellectual challenge. While I know he road tested his builds, most were primarily eye candy. With few exceptions, he’d build them, try them out, and, then he’d mess with the set up. Often he’d set up friends with his bikes. At any rate, there are eight bikes that are completely built, two that are mostly built up, and another eight or so framesets. His wife would like to find loving homes for these. As you can probably make out, he was a vintage bike enthusiast. Matching these up with the right people will be a bit problematic for me. Any suggestions? I’m thinking I can probably start with Craigslist here in the Twin Cities. And I guess I can research a while there to get a sense of the value of the items. And maybe I could use ebay, too, but I’d rather avoid the bother of shipping. That might work better for the frames. And then the parts. Wow. I made a trip into his favorite neighborhood shop and asked them to come take a look. Maybe his wife can get free repairs for five years or something in exchange for the piles of parts. Alas, the photo posts fine in preview, and actually shows in the 'thread review' as I reply, but I'm not sure why it's not appearing in the main view. Yeow-sa! Any idea what size frame he rode? It looks like 54s or 55s to me. Might be a good reason for a road trip to Minnesota . . .
Not the frames and built-up bikes, but if there are lots of extra parts, you might see if there is something like Neighborhood Bike Works here, a group that works withy disadvantaged kids, teaching them about bikes so the kids can earn them. I bet that DeRosa would fit me. Talk about eye candy for a cyclists. Sorry to hear about Bill, sounds like a real bike guy. Great bikes, too small for me or I could be interested. Can't help on how to sell, as I've never tried. I've always been skeptical that bikes like that have a "market value" that really means anything. Find the right guy who wants that bike in that size, he may pay a lot. Otherwise, not so much. But I'm not really in the market, so I don't know. I've got some pretty nice vintage bikes, and I've given some thought to how to pass them along when I kick the bucket. Haven't figured it out, but I've thought about it. Good luck, I hope you can get them to people who share Bill's passion. I grew up in the St. Paul suburbs (Shoreview) when it was a fine time for a kid to ride everywhere and anywhere, and I did. I hope your brother got to enjoy at least half the cycling that I did; it certainly looks like he had the machinery for it! If you haven't already, you might want to consider taking this photo by County Cycles on Lexington, the old Carrier's Hardware. County came after my time, but when I used to go back to visit my parents, it seemed like one of the better and friendlier shops. They may be able to help you find good homes for those bikes; I think they'd definitely be able to help you appraise them. As a frequent seller on Craigslist, I think you should be able to find someone via CL who shares a common appreciation for Bill's collection and will pay fair value. It may take a few tries and you will have to meet them in person, but it should be fairly obvious in the first five minutes if the person is just a shark or a real enthusiast. I would start by listing a somewhat rare or valuable part/wheelset (something an enthusiast/collector would appreciate) or just a representative frameset. Don't list the whole collection or make reference to it, at least on Craigslist, or you will attract the sharks. Ignore low-ballers and anyone who is outright rude. When the right person or person comes along, let them know you have a much larger collection available and work from there. Find the right person and you should be able to sell quite a bit at fair value. Good luck. You could also try the Vintage board at RoadBikeReview and similar boards to locate collectors who are close to you. Thanks for the advice and good wishes. Bill lived in Madison, and so his bikes are there right now. I was just thinking the TC, where I live, would be a larger market. I know of a few folks that he bartered with in Madison and will reach out to them. Most of the bikes and frames are 56 cm c-c. At any rate, I like the idea of introducing the items slowly. In terms of finding a home, I know Bill's preference would be to find an appreciative owner first and the financial arrangements would be secondary. And I think his wife is similarly inclined. So that may simplify somewhat the problem of determining a true market value. This is a nice slide show. I really liked the hawk along the railroad tracks. Ebay-big market total pain. Like today, some guy in Brazil is upset with me b/c USPS won't ship priority mail boxes down there, only Global Express, which is like 300 bucks for a frame to Brazil. Just by example. Plus, nice stuff is hard to pack and ship unless your LBS has an unlimited box supply (hold out for Madone boxes, they're like reusable travel cases). Doing it with standard Uline boxes and bubble etc takes about an hour a bike. Ship by Fedex, cheapest way almost always, 65 bucks coast to coast and free pickup (UPS charges 10 bucks or so to pick up). The fees kill, they even take a percentage of shipping, so figure at least 15%-on a hgh end bike this is big coin, and often close to my profit. Much better money for partouts, but doing all the little packaging is a pain. Generally though you get more money out of a given bike, unless the bike is really special as built. Craigslist-flake city. Everybody wants it, nobody shows up. Endless emails plus the spam, and bottom feeders (like me, admittedly). I really want to do a used classic/highend shop with a web presence, but it'd have to be just a labor of love. I'd check if there's a local cycling group that has a web forum where you can advertise bikes for sale. I've sold several bikes over the years by advertising them in local forums like that. 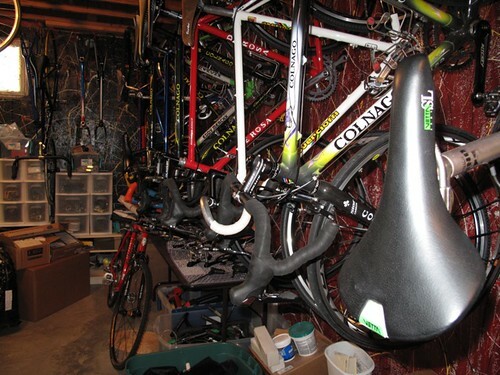 The advantage over general auction sites is that your audience is mostly keen cyclists. Both the local cycling clubs of which I'm a member offer that sort of service.